Our Amish 49" Lancaster Mission TV Stand brings understated mission-style elegance to the living room, office, or bedroom. 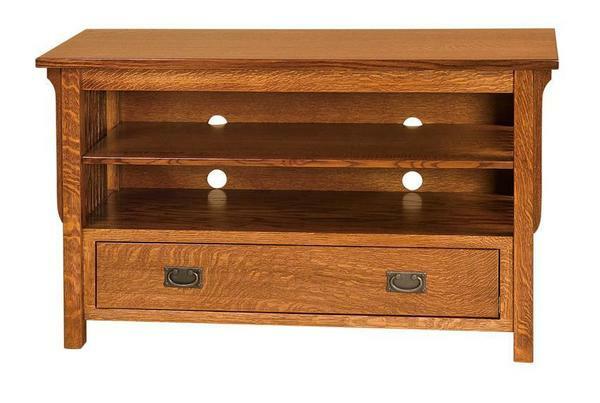 Featuring an open design great for storing a DVD player, DVR, and game console, or books in a home office, it also comes built standard with a dovetailed, soft-close drawer. Details like awnings that give the appearance of helping to hold up the 1-inch thick top of this television stand add character and elevate the clean design. Choose from a variety of premium wood types and finishes to make this mission television stand one-of-a-kind. Interior Drawer Width: 38 ½"